The Islamic Development Bank (IsDB) and the European Investment Bank have discussed at meetings held in Luxembourg this week opportunities for co-financing new projects in Africa and Southern Mediterranean Countries. 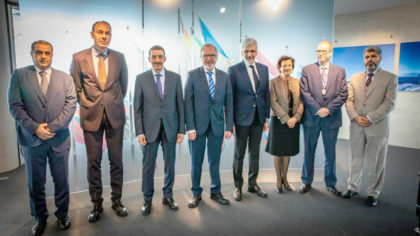 The meetings were held as an IsDB delegation, led by the Bank’s President, Bandar Hajjar, is visiting the European Investment Bank’s headquarters in Luxembourg. During the talks, EIB and IsDB teams discussed ongoing projects and potential windows of cooperation to boost the impact of both institutions finance and technical assistance programs. “There is an acute need to support sustainable investment in many regions where we are both active. We can deliver more impact by bundling our respective strengths and working closely together,” he added, according to a press release of the EIB. “IsDB and EIB, together with other Multilateral Development Banks, are key players in catalyzing private investment in support of public policy goals. We need to strengthen our common efforts to support economic resilience and deliver on our commitment to the Sustainable Development Goals,” he added. “To achieve the SDGs, new sources of finance need to be tapped, such as the global capital markets. This requires new types of development projects that operate at the nexus of financial viability and development impact. It also requires new and innovative Islamic finance products that mitigates the perceived risks around investment. Solving this challenge is central to my vision for a new development model,” he argued. EIB and IsDB have been working together to provide needed finance and advisory services for sustainable development. Since 2005, the EIB and the IsDB have co-financed nine projects with a total investment of €1 billion in Lebanon, Morocco, Tunisia and Sub-Sahara Africa.